I'm definitely not a huge fan of Halloween. I have my reasons, but one of the biggest is that my parents weren't fans, so we always did fun family activities the night of Halloween growing up. I never missed out on the trick or treating because we had our own pumpkin baked goods that night, delivered some to the homebound, and returned home to carve pumpkins, watch a festive film, and so on. So the concept of candy, candy, candy is odd and new to me. 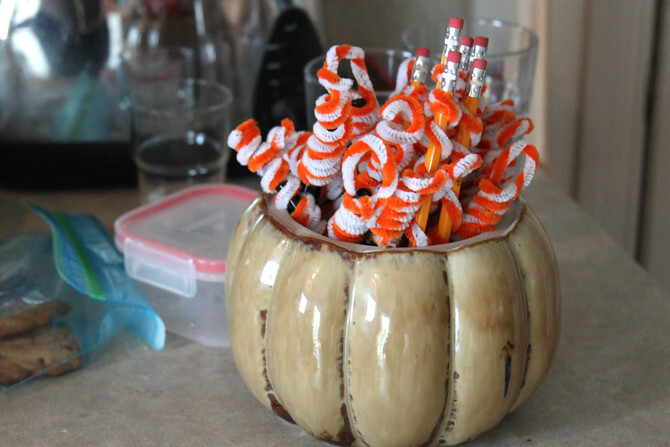 Thus, the pipe cleaner decorated pencils. And despite Bobby's comments, many children were excited about getting one! On a non-sugar note, there are a handful of goodies I've wanted to share with you. Just in time for the weekend and those slower, more relaxed days. MADE's Ruched Leggings Tutorial (for girls and women). Her tutorial, of course, uses an old t-shirt to make the leggings. Outdoor Art wall fun. If you're excited about chalkboard paint, you've got to check this out from the Angry Chicken! Over at Nurturing the Tender Years they have awesome Montessori Inspired Workboxes. There are ideas liking beginner threading, pouring rice, and other tactile activities for young children, all kept in one place. On the Webblog, Bri introduced me to these adorable pumpkins from the blog Thompson Family-Life. Here is the Fabric Pumpkin Tutorial-- the most beautiful fall decoration out there. Have an enjoyable last weekend of October!